Hello friends, I have wonderful news! If you’ve followed Hunt & Gather Home from the very beginning, you know that this business began as blog, started by two friends that share an eye for design, a love for old houses, and a fondness for the written word. Some seasons of life have allowed me and Brandie to post more often than others. We’ve celebrated joys and shared struggles through the lens of our homes. Within the wood-frame walls of our houses we find comfort, strength, peace, and inspiration, and we’ve enjoyed sharing that with all of you. And now, we look forward to sharing another of life’s most joyous occasions: Brandie’s upcoming marriage in New Orleans! She will be back on the blog soon (and perhaps even weekly!) to share design details about her big day, but I’m so honored to announce that Hunt & Gather Home will have a hand in bringing these details to life at the lovely and historic Columns Hotel on St. Charles Avenue. From historic preservation to interior design to wedding decor, Hunt & Gather Home will be busy these next few months celebrating the things we love most: historic architecture, good design, and the love of family. Happy Halloween! I’ve been on the road a lot this month on several trips to North Louisiana. The drive through rural Louisiana farmland is always a beautiful one lined with cotton fields, sugarcane, and vernacular architecture (my favorite!). After years of driving through the small town of Columbia, Louisiana, and thinking, “I’ll stop next time,” I finally decided to pull over and photograph this fantastic early twentieth-century wooden church building. 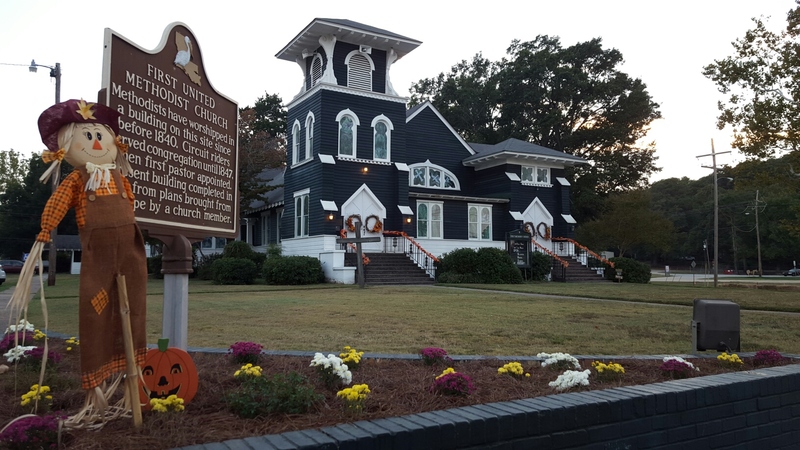 The First United Methodist of Columbia was constructed in 1911 by contractor Frank Masselin and Son of Monroe, purportedly from plans brought from Europe by a church member. The rectangular church is clad with wooden clapboard and features a combination of Romanesque, Gothic Revival, and Craftsman architectural elements. Most prominent are the two towers of unequal height with low, overhanging eaves and exposed rafter tails, all Craftsman features. The recessed belfry at the top of the taller tower features false buttress-type supports and rounded arch louvered vents. Beautiful stained glass windows grace the second-story levels of both towers; the windows on the shorter tower are stylized quatrefoils of Gothic design. The main doors to the church are located beneath pointed arches in each tower. If you look closely, you will notice a Gothic mouchette motif on the wooden doors. The church was expanded in 1939, and the addition appears seamless from exterior view. Wood siding, paired wood windows, and a consistent use of similar stylistic features blends the 1939 addition with the original structure. 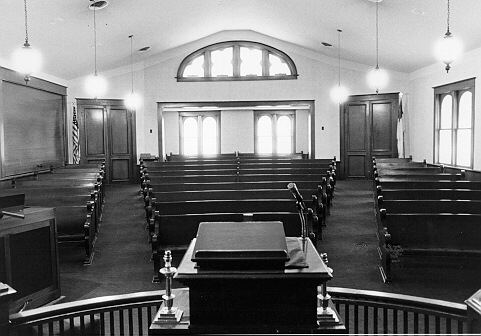 The church was closed on the day I stopped to take photographs, but this photo, courtesy of the National Register nomination, shows the interior of the original 1911 sanctuary. I would love to see the semi-circular railing in person. This photo also shows the original wooden pews. 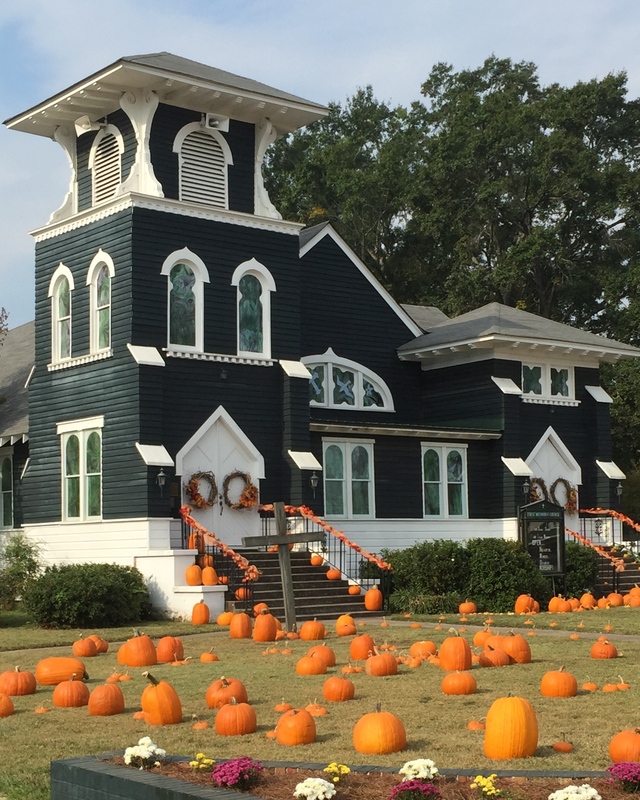 It was a special treat to catch the church decorated for fall, but it is beautiful at any time of the year. Next time you’re driving up LA 165, make a stop in Columbia. 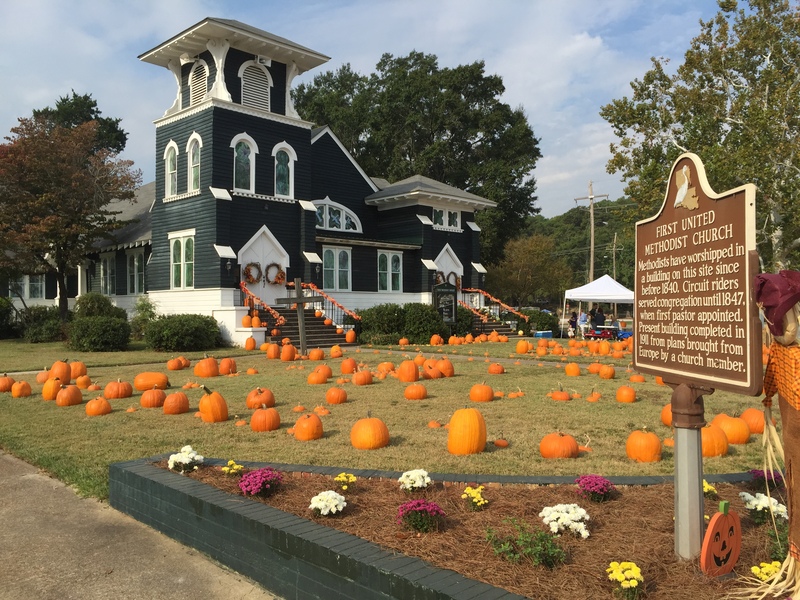 The church is on the edge of Columbia’s cute little downtown on the banks of the Ouachita River. Kudos to this congregation for taking such good care of this beautiful building. P.S. – I’d love to know more about the history of the church, those European architectural plans, and the members who brought them back. Please share what you know in the comments!